Initial Course - 5 days, Refresher - 2 Days. We incorporate hands-on training with inert explosive devices and their component parts. Live explosives demonstrations (NSTC only) of a shoe bomb, liquid explosives and other aviation relevant IED’s are all part of the demonstration events. The format of this Department for Transport certified course includes use of classroom instruction, group discussions, video footage and case studies alongside practical exercises.The course targets the issues raised by the current security climate and heightened threat levels, taking into account the motivations and tactics which have been used recently and those which are possible for future attacks on aviation. We continually assess our content and make regular amendments to the programme to ensure fresh, accurate and relevant information is passed to our delegates. This mandatory course is aimed at security managers employed by airports, airlines and their agents and in-flight catering undertakings and secure clean contractors, who have direct managerial responsibilities for security personnel carrying out aviation security duties. Managers will be provided with information to enable them to understand the aims and objectives of the aviation security organisation; the threat to civil aviation and risks to its security and to be able to implement current security policies and procedures outlined in the relevant airport or airline security program. This course is designed for all those who have the responsibility for ensuring that an Aviation Security Programme, together with its implementation, meets all legal provisions, and, in addition, it will provide a greater understanding of an ASM’s roles and responsibilities. Redline will work with you to deliver the mandatory syllabus as set by the Department for Transport. 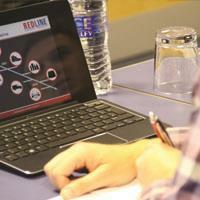 Combined with expert instruction, state-of-the-art training facilities and a passion for quality, the Redline team builds on your delegates’ own experience and provides “informed training” which is reflective of industry best practice, through lessons identified by the industry as a whole. The course targets the issues raised by the current security climate and heightened threat levels, taking into account the motivations and tactics which have been used recently and those which are possible for future attacks on aviation. The format of this Department for Transport certified course includes use of classroom instruction, group discussions, video footage and case studies alongside practical exercises. We incorporate hands-on training with inert explosive devices and their component parts. Live explosives demonstrations of a shoe bomb, liquid explosives and other aviation relevant IED’s are all part of the demonstration events. With more than eight years teaching this course, Redline will work with you to provide on-site teaching and advice for best practice in an engaging, interactive learning environment. Whether you want to train at your own chosen location or within our state-of-the-art training facility, Redline can work with you to meet your requirements. Find out more about our initial or refresher courses today by calling 01302 288360 or complete the enquiry form below.